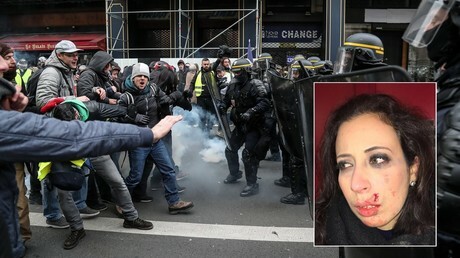 Nadège Abderrazak was hit near Place de l’Opéra in the French capital, resulting in a bloody cut on her face and a swollen mouth. RT’s editor-in-chief Margarita Simonyan tweeted a photo of Abderrazak after the incident, confirming that the reporter has been taken to hospital. “Our correspondent was injured in the face during the rally in Paris. She went to the hospital,” wrote Simonyan. The injury occurred after Yellow Vest protesters became angry that police would not let them travel from the Opera area to Champs Elysees. Some demonstrators then launched projectiles at police, one of which struck Abderrazak. It comes as the French capital experiences its fifth straight weekend of Yellow Vest protesters who are calling on President Emmanuel Macron to resign. Some 2,200 demonstrators turned out in Paris, some clashing with police, prompting officers to deploy tear gas. At least 95 people have been detained, according to the latest figures.